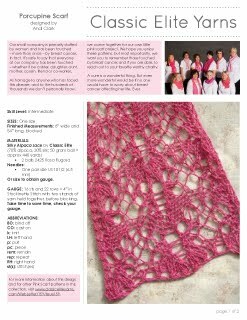 Welcome to the third installment of the Pink Scarf Project, our tribute to breast cancer awareness month! This week, our two scarves come from Cheryl and Andi, our Hub Mills Store employee/knitting phenom and our customer service guru. Our first scarf, designed by Cheryl, is knit in Wool Bamboo and employs a provisional cast-on. 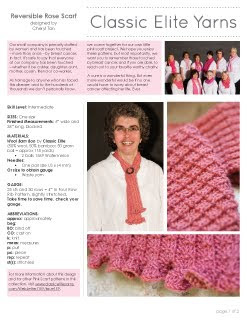 If you're not familiar with this technique, take a look at our tutorials section of the website and knit away! I was working on Hope from the Classic Elite Sanctuary pattern book when we were told about the pink scarf project.While working on the ribbing, I thought it would make a nice scarf and I loved working with Wool Bamboo.I just changed the ribbing a little to make it reversible and added a little ruffle to each end. And voila! My first design. Next is a scarf from Andi Clark. You might recognize her name from one of her many published patterns, or perhaps from our Staff Allegoro Project, where her knit lace edging sparked many readers' creativity. This simple reversible lace scarf knit in Silky Alpaca Lace dresses up any outfit, and I think her inspiration to hold the yarn double is easy to relate to for many knitters. I love knitting lace. But lace yarn is too thin for me to comfortably handle. What to do? Double it! This scarf is knit with two strands of Silky Alpaca Lace. With two strands, you can use a large needle and the knitting flies. I picked this pattern because it is reversible. It’s an easy pattern, but you have to pay attention to it. Once done, block the life out of the scarf and it will be beautiful! I think you left out the first ruffle on the Rose Scarf pattern. Hello Martha! The first ruffle is worked after the rest of the scarf is completed by pulling out the waste yarn of the provisional cast on and working the ruffle with the resulting live stitches. If you click on the words "provisional cast on", the link should take you to a tutorial on our website. Good luck! Pink Part II--Let's Hear it for the Boys! Vogue Knitting Live--There's Still Time!